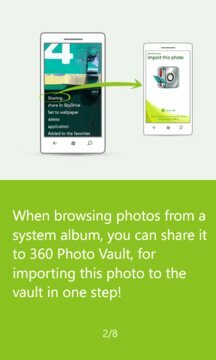 360 Photo Vault is a privacy protection tool for your private files on your Windows Phone mobile device, designed by Qihoo 360 Technology Co., the leading company in the Internet security in China. 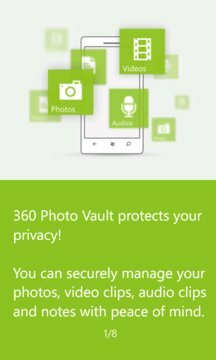 Using dual safety protections, it provides ease of browsing, viewing, creating and management for your private photos, video clips, audio clips and notes. All your secrets in your Windows Phone are safe with is tool.